Yes, we’re only six days into 2011, but Apple’s already been at the center of a big leak with pics and videos of an unknown iPhone model surfacing online. Here we offer a Zapruder film-worthy analysis of the images. It’s only just barely 2011, and yet Apple’s already had a big leak–parts for an unknown iPhone model have surfaced in online pics and videos. They’re similar but subtly different to the iPhone 4, suggesting the iPhone 5 or a Verizon version. The YouTube takedown means the intrigue has dialed up a notch–Apple seems to act in this heavy-handed manner only for a genuine leak, whether it’s over leaked designs for the iPad 2′s protective cases, or the dramatic leak of a prototype iPhone 4 last year by Gizmodo.com. Whatever these new parts are, they are something Apple would prefer not to have in public view, which implies they’re not development parts for the iPhone 4 that have found their way into the public domain by accident. Evolved Antenna Design: No Antennagate? The newly leaked parts are almost identical to the iPhone 4–a highly-detailed, machined block of steel and aluminum with structural and electronic components built in. This design caused Apple’s embarassing Antennagate affair, with phone performance allegedly marred just by holding the antennas. 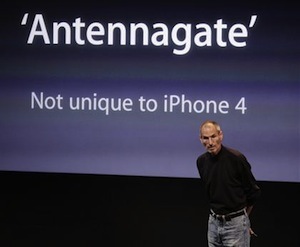 While Antennagate may have been blown out of proportion by an excitable (and scientifically simple) media, Apple’s learned something for its latest phone: The new parts show a different arrangement, so different antenna segments are bridged when the phone’s held in normal use, and there’s an extra segment in the frame compared to the iPhone 4. Without knowing how these will be wired-up electrically, we can’t tell much about how they’ll work. But the extra segment is interesting–it suggests Apple really may have adjusted where the antennas are, to prevent signal dropouts. There’s another possibility: The tweaks to the iPhone frame may be necessary to accommodate the different radio-frequency needs of CDMA signals versus the iPhone 4’s GSM-signal design. This means the case could merely be an iPhone for Verizon (the iPhone 4V perhaps), and not an iPhone 5 at all. It’s a distinct possibility, though one detail is wrong here: The new parts also have a SIM card slot. Does this imply Apple’s iPhone 4V is a dual GSM/CDMA world phone? That would make sense, since Apple dislikes selling devices that disappoint users, and a $600 phone that only works in the U.S. would seem very limiting. Some thinkers suggest the SIM slot means Verizon LTE support. That’s possible. But will Apple embrace LTE right now, at the early point in the tech’s exploitation? Remember how hesitant it was to adopt true 3G tech in the phone. Rear camera gone, evolved, or just moved? GlobalDirectPart’s video revealed a host of tiny design tweaks, but one biggish one too–the new parts don’t seem to have a hole for a rear-facing camera. Some commenters have pondered that this means a camera-free version is on the way, for enterprise users. We think it merely suggests Apple has sourced slimmer components for the phone’s camera, and worked out how better to build it into the frame. This suggests Apple may not be going for a higher-res unit this time, or one that has neat tech like mechanical zoom–it may stick with 5-megapixels. Why the fuss about a phone? Why all this fuss about leaked parts of a phone? There are a number of reasons, starting with the fact that a leaked prototype last year hit the international news media, and resulted in complex legal issues for Gawker Media and an unusually personal reaction by Steve Jobs. The leaked parts we’ve seen so far don’t teach us very much, but some sources have hinted they’ll soon reveal more about the chips inside, and the screen tech, so we may get almost as detailed a hint about the new phone as Gizmodo did last year. This week’s leak is almost as significant for Apple as last year’s–which affected its share price, briefly. And this is the iPhone here, one of the flagship devices of one of the world’s largest companies. It’ll sell by the tens of million, and bring billions of dollars of revenue. 2011 may be a relatively quiet year for Apple–it’s not expected or rumored to be releasing a new paradigm-busting machine like the iPad, or even a game-changer like the novel new Apple TV. Revisions of its existing products are likely all that’ll happen, so they’re important. What do we think these parts are? We think they’re really the iPhone 5. It’s consistent with Apple’s strategy of refining a design before radically making it over–think of the iPhone 3G and 3GS–and there’re too many detailed design tweaks here, implying some big internal changes. The antenna configuration changes could mean the iPhone 5 is both CDMA and GSM-capable, and that would tally with Apple’s habit of selling one design to everyone. And we know it’s definitely coming to Verizon, with access to millions more customers in the U.S.